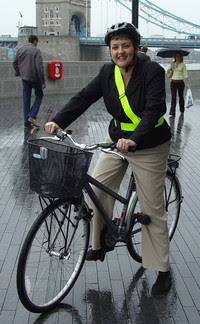 Come to the Lambeth Cyclists' annual meeting next Tuesday, 21 May 2013 7:30pm at our new venue the Effra Social, 89 Effra Road, Brixton, to hear from Lambeth London Assembly Member Val Shawcross (pictured right) on what Boris' grand cycling vision will mean for cyclists in Lambeth. Boris set out his vision in March with much fanfare but what will it actually mean for us in what is generally considered to be one of the most pro-cycling boroughs in London? We hope Val can tell us - as well as being Lambeth and Southwark London Assembly member she is also Chair of the Assembly's Transport Committee and so has an important role in overseeing the work of the Mayor and Transport for London. This will be an opportunity to engage Val in discussions around cycling policy in London especially as it relates to Transport for London roads. These are the major red routes in the borough such as Clapham Road, Brixton Road, Streatham High Road as well as gyratory systems such as around Tulse Hill, Vauxhall Cross etc. At the meeting we will also be electing the Management Committee for the next year: this is your chance to get involved in running Lambeth Cyclists. Have you thought about getting more involved in our campaigning, communications or running rides and events? The following posts are up for election: Coordinator, Secretary, Treasurer, Council Liaison, Rides and Events, Membership and Newsletter, Publicity and External Affairs, Projects and Bike Events. For an explanation of each of the roles see below. The commitment is not onerous and you can make the role your own: contact Borough Coordinator Charlie Holland (charlie@palaceofvariety.co.uk / 07795462568) to find out more. Coordinator: overall chairing role; principle point of contact for the group; liaison with LCC office. Treasurer: responsible for the management of funds for the group. Council Liaison: principle point of contact with local authorities regarding highway matters. Newsletter editor and/ or communications: principally responsible for production of the group's newsletter plus other tasks such as news releases. Projects coordinator: general role to promote or initiate ad hoc projects. Rides coordinator: general role to coordinate a rides programme. Note that committee members may be nominated for various combinations of the roles and responsibilities above, and posts can be held on an 'as required' basis (i.e. for discrete projects rather than as an ongoing role). Roles and tasks can be flexible and allocated to suit people's skills, interests, time, etc.